The UK’s #1 Dubstep radio station are teaming up with one of the UK’s leading streetwear stores to do a very special broadcast. 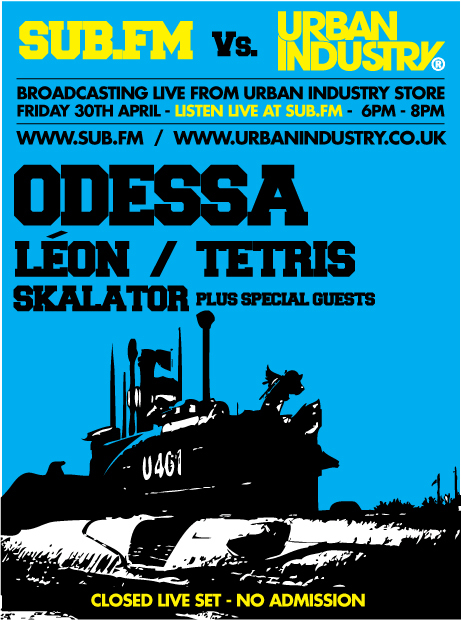 On Friday 30th April, Sub FM will be broadcasting live from the Urban Industry store between 6pm & 8pm! Sub FM resident (and one half of Kryptik:Elementz) Odessa will be headlining the event bringing some serious Dubstep heat to your ears. I’m expecting a bombardment of dubs on this one. This is a real interesting concept … like an in-store event, but for everyone in the country! Don’t forget that Sub FM operate a chat room as well, so we can all party it up in there. An online in-store? Madness.